New home in great La Center neighborhood – Heritage Country Estates! This great room plan has den on the main, 4 bedrooms + loft upstairs. Features include A/C, custom cabinets, stainless steel appliances, slab kitchen countertops, wood wrapped windows, gas fireplace & much more. Other plans & lots available to build and pick finishes. BUILDERS MODEL AT 401 E SPRUCE AVE, La Center. Sat/Sun 12-5. 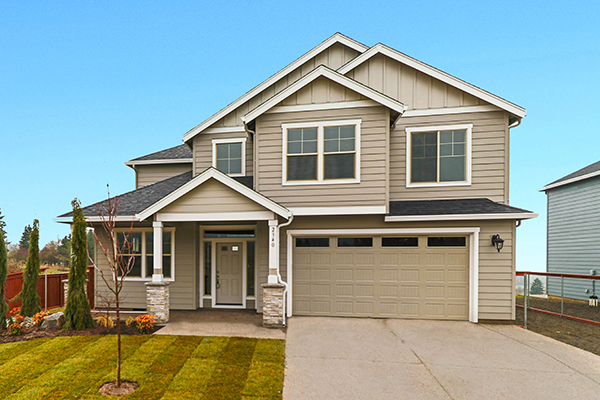 Call Nathan Cano’s team at (360) 823-3333 or contact us today to see this lovely brand new home! Cano Real Estate LLC, Equal Housing Opportunity. This information is from sources deemed reliable, but not guaranteed. All measurements are approximate and information is subject to change. Our agents write often to give you the latest insights on owning a home or property in the Vancouver WA & Portland OR area. We had Megan List our home to sell and we had a full offer with 48 hours of putting the sign in the yard. Megan was amazing to work with during the entire process. I have bought and sold several homes and would highly recommend Megan. She is not only caring, patient and organized, but she is also incredibly knowledgeable. Megan will be my “Forever Go To Realtor”. Kelly Winn helped me purchase a home while keeping my current home as a rental property…great advice and strong knowledge of the local market. Would quickly recommend to friends! Excellent from beginning to end. Megan is the best. She listened to us about what we wanted and she searched for it. Not a big inventory so we began to get discouraged but Megan stayed positive and kept us going. We love our new home and would/will refer Megan and Cano to others. Our experience was positive in every way and we were able to close much earlier than was anticipated because the right people were involved at each step in the process. We sold our house with Guy and he was with us every step of the way. Every single member of the Cano team is there to help from the initial meetings, to the marketing photos, to closing the deal. You truly do hire a realtor and get a whole team! We will definitely use them again for our real estate needs!! My past experience with Nathan Cano Real Estate has been business related. When it came time to sell my home, there was no other choice. My demands are high and I expect excellence. When I hired Nathan as my broker, I got a pro team from beginning strategy planing through closing. My home sold in one day. We would highly recommend using Cano Real Estate to anyone. Our agent, Troy Frei, was very knowledgeable, honest and straight forward. We live in another state and to say that this was not a stressful situation to begin with, Troy really took the time to keep us up to date on every detail. His communication with us was pretty much daily. Truly felt like we focused 100% of his time on selling our home. We are very pleased with our experience and glad we choose Cano, especially Troy Frei! Guy Jensen was the best agent that we have ever worked with! Our deal was a difficult one. He never quit working on it and made sure we were taken care of on every step. He even drove me to the airport when it was time to fly back home to drive my family out here after our house closed. Its been a couple months since we bought our house and he still checks in on us. If we ever have any friends of family in need of an agent in the future it will be Guy Jensen and Cano Real Estate! Troy helped my wife and I find the perfect home for us. We were first time house buyer and he made the entire process very stress free. Troy is an absolute professional. His communication was great, and he worked around the clock for my wife and I. I am very thankful for Troy I recommend him to all of my friends and family. The content relating to real estate for sale on this web site comes in part from the IDX program of the RMLS™ of Portland, Oregon. Real estate listings held by brokerage firms other than Cano Real Estate are marked with the RMLS™ logo, and detailed information about these properties includes the names of the listing brokers. Listing content is copyright © 2019 RMLS™, Portland, Oregon. Data last updated 2019-04-24T07:58:52.62.Data deemed reliable but not guaranteed.